PRINCETON JUNCTION, N.J. – Apr. 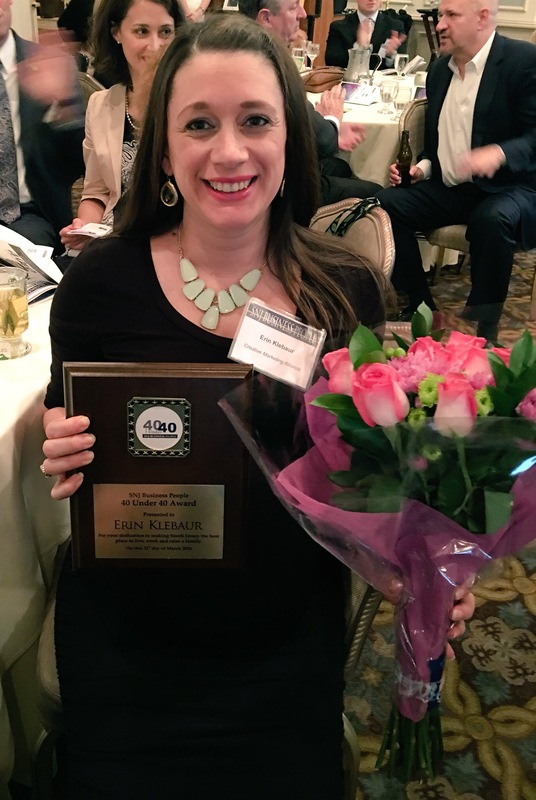 4, 2016 – Driven by passion for masterful excellence Erin Klebaur, director of marketing services at Creative Marketing Alliance (CMA), a full-service marketing firm located in Princeton Junction, has been recognized for her dedication and professionalism as one of SNJ Business People’s 40 Under 40. Erin Klebaur, director of marketing services, displays her 40 Under 40 award at The Mansion in Voorhees on March 31. She was honored at an awards reception on March 31 at The Mansion in Voorhees. Klebaur, who began her tenure as the executive assistant to the CEO, now manages her team of 15 by setting the example that hard work and dreaming big payoff. She now leads the marketing department, overseeing the design studio, public relations and social media team, strategy and business development and client management teams. “I continuously strive to be the best I can be, and this award gave me a sense of reflection on how far I’ve come, as well as looking forward to so much more,” Klebaur said. 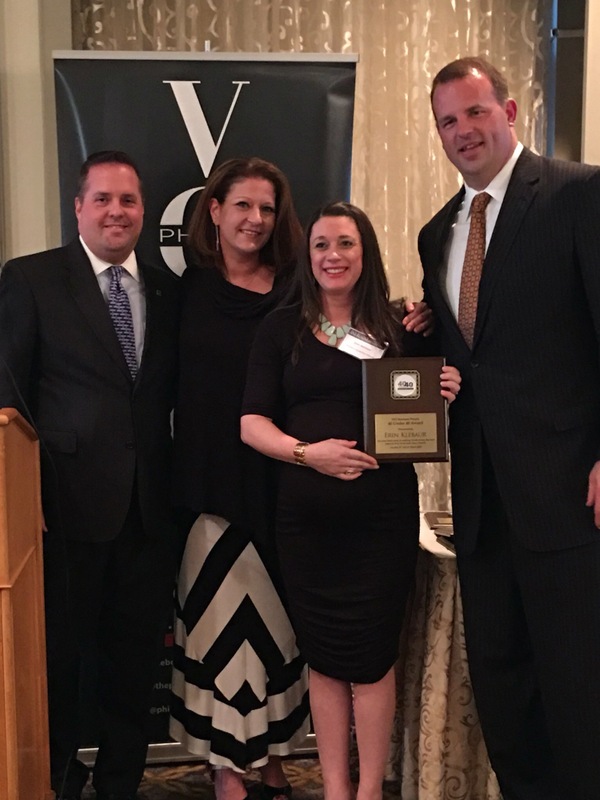 Rob Curley, South Jersey market president, TD Bank, Jenny Ryan, publisher of SNJ Business People, and Jon Runyan, former Congressman and Philadelphia Eagle, present Erin Klebaur, director of marketing services, with her 40 Under 40 award. Klebaur was also recently named one of SNJ Business People’s Top Women in Business. Klebaur’s major responsibility areas include: Manage business unit operation and promotional budgets, ensure CMA brand awareness and consistency, provide creative direction/strategies for clients, and ensure growth, stability and bottom-line profit for the marketing services business unit. Further building upon her foundation of leadership, Erin has amassed an expansive portfolio of professional accomplishments by developing creative programs to meet client needs. She has led her team to numerous awards, including a record-high 22 New Jersey Communications, Advertising and Marketing Association (CAMA) ASTRA Awards in 2014. During her tenure, CMA has also been recognized with the 2016 Outstanding Small Business of the Year by the MIDJersey Chamber of Commerce and with more than 300 other industry awards throughout the years. 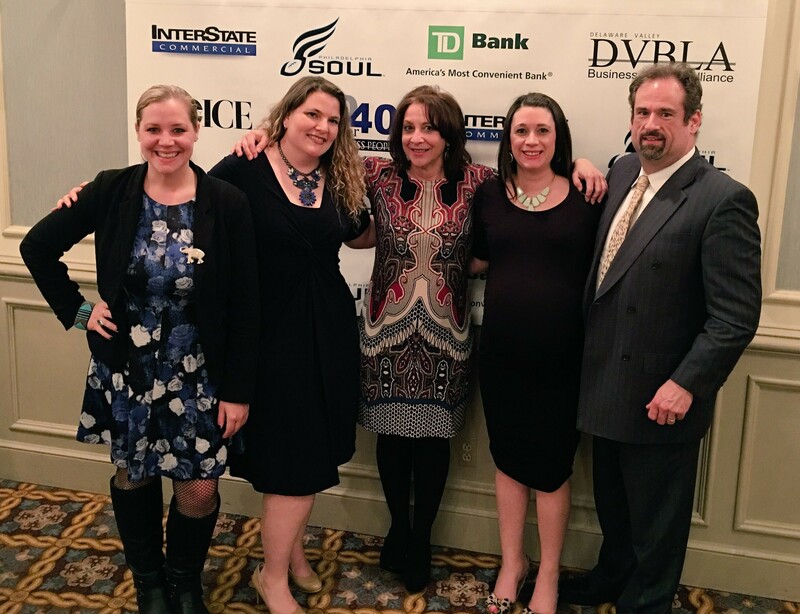 Erin Klebaur, director of marketing services, with her 40 Under 40 award at The Mansion in Voorhees on March 31 with members of the CMA Crew. “Achieving success at an early age is a great accomplishment, and we are thrilled to be recognizing you,” said Jenny Ryan, publisher of SNJ Business People. Klebaur is an alumna of Rider University where she graduated with a communications degree, business and professional speech track and marketing/advertising minor.